Nearby parks include Alfred J Loos Stadium and Sports Complex, Hornet Field and Greenhill School Baseball Field. 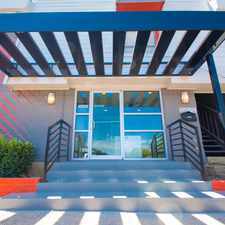 Fiori on Vitruvian Park Apartments has a Walk Score of 53 out of 100. This location is Somewhat Walkable so some errands can be accomplished on foot. Fiori on Vitruvian Park offers sophisticated amenities and luxury apartments in Addison, TX. From the artwork of Dale Chihuly to the finest amenities, such as a penthouse lounge, resident wine storage, and waterfall courtyard with fire pit, Fiori is the pinnacle of art and high-end living near Dallas. Take advantage of our on-site state-of-the-art fitness center, infinity edge pool, and internet café. Fiori apartment homes are finished in granite, stainless steel, and hardwood, and feature design elements such as frameless showers, free-standing tubs, and California Closets. Fiori on Vitruvian Park is surrounded by acres of creek-adjacent park and is just a short commute to Downtown Dallas, DFW, prime work centers, and top entertainment destinations in the Metroplex. Visit Fiori on Vitruvian Park today and experience premier resident services and luxury apartment living in Addison. Explore how far you can travel by car, bus, bike and foot from Fiori on Vitruvian Park Apartments.